From 24" drop to 36" drop. Share your VeeBoards pictures and experiences with other drivers! 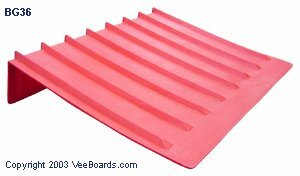 All the benefits of VeeBoards®, and MORE! Manufactured from user friendly, high density polyethylene, these BrickGuards® are designed specifically for the brick and block transporter. 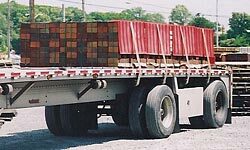 DOT requirements specify that all brick and block loads should be loaded in such a way as to assure that no pieces come loose, endangering those behind. Also, BrickGuards® or VeeBoards® MUST be used if the strap is in any danger of being cut or damaged by the freight. 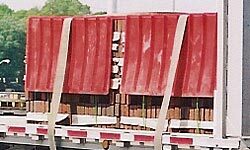 The BrickGuard® is designed to cover the entire load, more effectively than any other product available. Back to the BrickGuards	® Catalog! © Copyright 2019 VeeBoards.com All rights reserved.